Pocketburgers.com: VIDEO: Surfing geese, anyone? Now before you get excited, we should point something out – these geese that we're about to show you "surfing" aren't actually, you know, on boards, standing up, feathers in the wind. They're not even wearing wetsuits, for God's sake – it's like they've naturally adapted to float on the water. Crazy stuff. 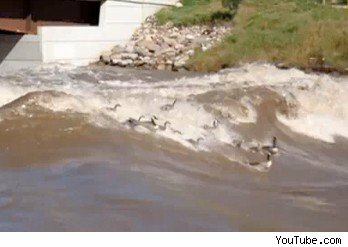 In reality, these "surfing" geese are just casually floating into, onto and around heavy waves on the Colorado river, and for some weird reason it makes for compulsive viewing. Look at them geese, swirling around like it ain't no thing... internet, you never cease to amaze us.